One of the things I love most about modern technology is the ability to find anything online, choose the best one, and have it booked and ready within minutes. When I’m in proper cities, where THINGS HAPPEN, I’m a sucker for apps like Uber and Deliveroo. I know I should probably be dining out at independent restaurants and hiring cabs from local taxi agencies and what not, but honestly, who wouldn’t want a burrito brought to them basically IN BED? Plus it’s peace of mind knowing that everything is so regulated and controlled, that Uber knows where Bob in a Prius is taking me, and that I can see exactly how long it will be before my katsu curry arrives on a moped. ‘If only there was something similar for childcare’, I thought, ‘so you could find someone totally reliable online to look after your children for a bit.’ You know, for when Netflix is off line. And then I found out that there was and I honestly don’t know how more people haven’t discovered this before. 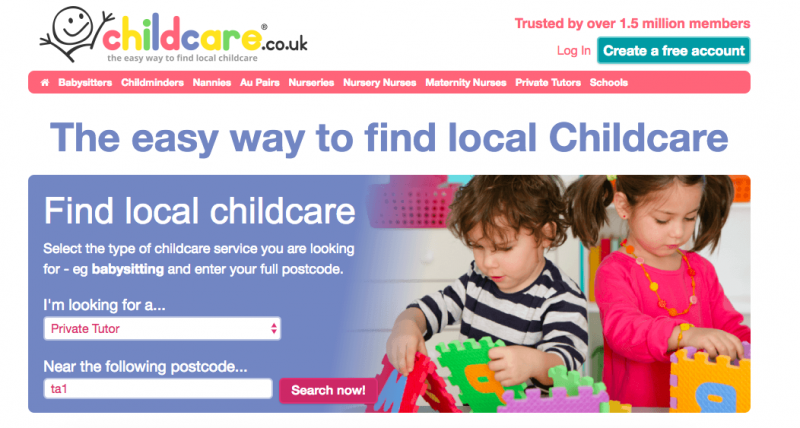 Childcare.co.uk allows you to search for and connect with babysitters, childminders, nannies, nurseries, private tutors and schools and also allows childcare providers to advertise their services. The site has more than 1.5 million users nationwide and is the largest online community for parents in the UK, having launched in 2009. Pretty impressive stats, as an ex boyfriend once said to me. Not only is it great for finding a local babysitter that you can trust, (rather than just the random teen from down the street), you can find anything from schools in the local area to private midwives. There are loads of private tutors too, which would be really handy for me as Belle is about to take her GCSEs and is a little lacking in the self-motivation department. Straight away I was surprised by how clear and easy it was to use. All you have to do is select the service you want from a drop down menu, type in your full postcode and immediately it pulls up a whole list of people in your local area who are suited for the job. I searched for tutors near me, and there were a few who were even less than a mile away – not bad at all. The site clearly displays a recent photograph of them, their hourly rates and a little bit about them before you even click on any profiles, so it’s easy to see what you’re looking for at a glance. The first few results gave me tutors with over 10 years of teaching and private tutoring experience, which is something I didn’t expect from a website like this. I thought it would mainly be younger people advertising on the site, but there’s such a wide range of people with loads of different experience that it was actually hard for me to pick out one that I thought would be the best. It’s also really easy to contact someone who you like the look of and get the ball rolling. Before you even send a message you can click on their profile to see more details such as their their qualifications, work experience and whether or not they have been DBS checked. You can also see reviews from other clients, so you can get a feel for what they’re really like. Each person also indicates their availability, so you don’t have to waste your time asking for tuition on a Wednesday if the tutor only works weekends. Even though Belle is grown up enough to stay at home on her own now while I pop out for the evening, I had a little browse through the childminders and nannies section and was surprised to see that there were over 100 nannies available to start straight away in my area, all with good qualifications and loads of experience. If I was stuck for childcare or had to sort something out as soon as possible, Childcare.co.uk would be my first port of call and I would definitely recommend to a friend with younger children.